Once in a while you’ll come across a recipe that will blow your noodle and definitely make your top five list of the most amazing thing you’ve ever eaten. Last Sunday, just such a recipe made our list on the Big Green Asian Egg blog! We were really happy to use our good pal James Watkins as our guinea pig…. thanks Jimmy boy! Char Siew Ribs, (pronounced Cha-Siew, drop the R sound) is a staple here in the tropical paradise we love to call home, Singapore. I adapted Meathead Goldwyn’s Amazing Ribs recipe to test out the authenticity and flavour profile of one of my favourite foods. I was amazed on both fronts! The great thing is that you can also make these ribs indoors in an oven if you don’t have the ability to grill outside. In Singapore, you’ll see Char Siew hanging in most hawker stall windows. 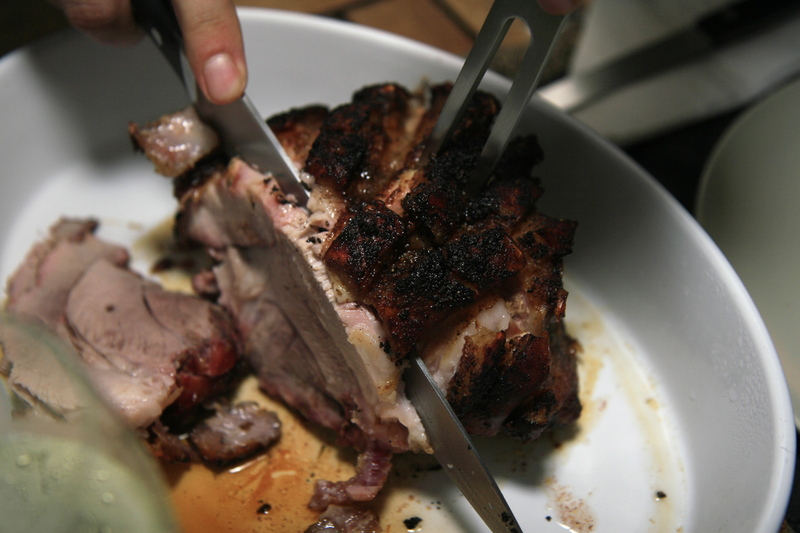 They tend to use the pork collar instead of ribs. The collars are loaded with fatty tissue that melts when slowly roasted. The flavour is intoxicating and you’ll line up for more! You can get a plate full of this delicious pork with steamed rice and veggies or my favourite, won ton noodles and broth with a healthy dollop of chili sauce. Needless to say, if you’ve ever been through Singapore, this is a dish you’ve got to try. My local hawker centre sells the above mentioned for $3.50 (SGD) or $2.60 (USD), a bargain if you’re on a budget! Mix all of the above in a metal bowl (as you may run the risk of staining a plastic bowl with that red food colouring) and set it aside. Let it sit for about an hour in the fridge and when you’re ready to pour it over the ribs, give it a good whisk! I used three racks of baby back ribs and cut them into individual ribs. Not something I normally do but for this recipe, you want each rib to be fully coated with that lovely marinade! When ready, place your ribs into a heavy duty zip-top bag, add the marinade and give the bag a good massage, trying to get as much air out of it as possible. Be mindful not to puncture the bag with the bone ends and so just to be careful, place your bag into a bowl that can catch any of the marinade should it escape. I marinated these ribs for roughly 30 hours, occasionally turning the bag and giving it a bit of a squeeze as and when I was in the fridge. Like I said, you can do these ribs indoors but since this is a blog about the Big Green Asian Egg, there was no way I was going to use the thing we call an oven. That’s where pavlovas are made! 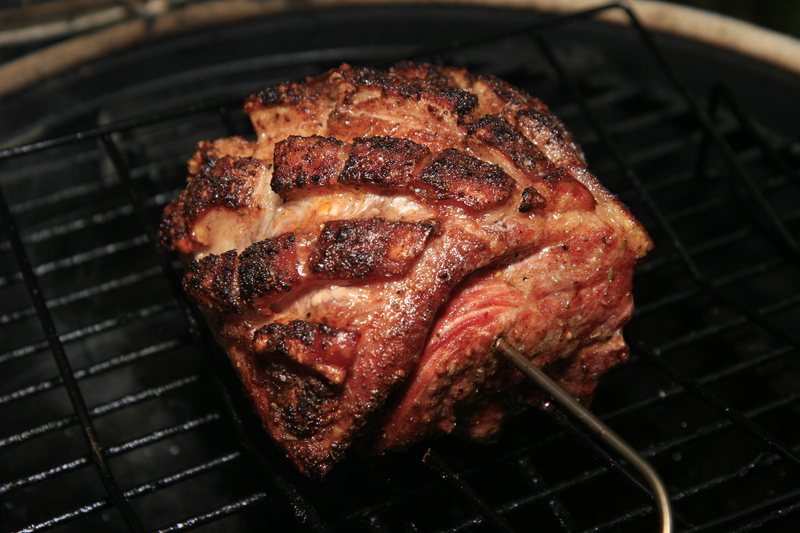 Set up your grill for 2-zone or indirect cooking, easily achieved with a BGE plate setter. Don’t add any wood chips as you want to minimise the smoke here. Stabilise your temperature at 225F (1017C) and hold it there using an ambient temperature probe. For these ribs, you’ll be cooking to time and not temperature so it’s really important you keep your ambient temperature just right. I also set up a multi-tiered grid that sat over a drip pan full of hot water. The grid was amazing for this set up and highly recommended to produce a high yield of rib goodness! Place the ribs back on the grid and roast them for another 15 minutes or so. These baby back ribs were pretty thin so I adjusted the roasting time from 3 hours in total to 2.45. When finally done, place the sticky ribs back in the big metal bowl, sprinkle some toasted sesame seeds (and please do toast them as you’ll release all the wonderful sesame flavour by doing this…just be careful not to burn them as that’s fairly easily done) and finely chopped green onion or chives. Toss the bowl around and get ready to serve. Our ribs were served with a wonderful soba noodle salad with a sesame and ginger dressing. A bit of Cantonese meets Japanese fusion to be honest. The result was AMAZING! Thanks Meathead and team at Amazing Ribs for the inspiration! Hello folks and of course all of you Big Green Asian Egg-heads – for those of you who celebrated Father’s Day last Sunday…happy, happy to you all! On this side of the planet the kids (Alex & Kalyna) surprised me with a wonderful little gift that did not include ties or socks (I suppose Christmas will be here soon enough!) No, from the offspring I received a little book called “The Great Ribs Book” by Hugh Carpenter and Teri Sandison. Nice, even the kids know what dad really wants! So after reading the very basic introductions and sections on rib types and techniques I had to dive in to the first recipe in the “Show Stopping Asian Ribs” section, “Best Chinese Baby Back Ribs.” If anything I would rate this book purely on the different recipes and sauces contained within – the techniques section is far too basic and very very very generic – my suggestion is go with your intuition when grilling these recipes and don’t be afraid to combine styles and past experience. Anyway, I wanted to try out the first recipe out of principle (being the first in the book) and because the outcome sounded really good. I got up early on Father’s Day and took my son Alex down to visit the “pig lady” at West Coast Market. We managed to secure the last two racks she had available, what luck! We came home and started the 6 hour marinade. I personally like the dry rub technique but I must admit, the marinade was good though I have a few new ideas based on this experience…more to come on that later. Combine all the ingredients and that’s it! This yields approximately 3 cups when completed. Add the ribs to a glass dish and coat every square inch of the ribs with this yummy sauce! I left the ribs in the fridge for just over 6 hours and then onto the grill. For the grilling I employed a mixed technique and if anyone can tell me how to improve on it, please do let me know…leave a comment! I fired up the BGE and stabilized the temperature at 325 F. I used the platesetter with the legs up and then added a drip pan full of water to see if that would provide enough steam for juicier ribs. I can’t say they were dry but I would like to try steeping them next time in aluminium foil packets like I do for the Fred Flintstone ribs. Anyway, I placed the ribs onto my trusty rib rack and let the magic begin. The book suggests a 90 minute cook time for spare ribs and as “pig lady” cuts us some huge ribs, I took the 90 minute route in hopes of cooking all the way through. I always get nervous with timings like 90 minutes for ribs given that my other rib recipe takes 6 hours to complete…anyway, this recipe certainly does not take the low and slow approach! After all was said and done I removed the ribs and covered them in aluminium foil for another 10 minutes and the result? Juicy ribs with an incredible sauce. Heather was right to point out that these ribs were not “fall off the bone” at all and the really thick parts could have been more tender which is why I want to steep them next time around.